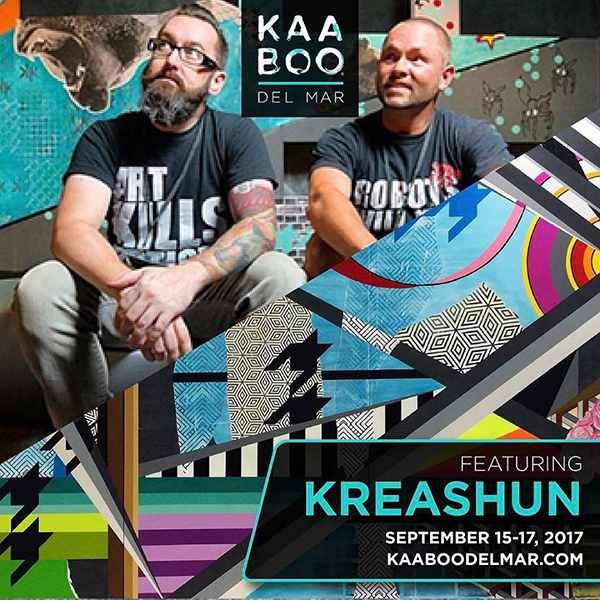 KAABOO arrives in Del Mar again this year with an ever increasingly impressive group of talent and experiences. This “not-a-festival” is an elevated, civilized event for those that enjoy all the good things about a multi-day live experience without the usual bar food, portapotty and standing all day frustrations. Everything is planned to make it the best, most comfortable experience possible. Having been in the past, I can say they deliver on the promise. Get your passes here to get in on the fun (limited number of single and two-day passes are still available as of this writing). Even though the main draw is the impressive musical lineup, the experience is not complete without the world class Public Art Installations, where awe-inspiring pieces are created both pre-show and live at KAABOO, and the Contemporary Art Fair where exceptional galleries and artists not only show work, but also create contemporary masterpieces on site. San Diego is well represented, and in this series of articles I am profiling some of the amazing artist and galleries that are going to be there and give a sneak peak (as much as they will reveal, anyway) to what they are planning for you. First up is KREASHUN, the collaboration between Monty Montgomery and J Feather, whose creations combine the two very different styles of these artists into unique “dream-like murals” that invite the viewer to dive into the layers. They are setting the bar high this year in their return to KAABOO, planning to complete a 20-foot “LIVE” KREASHUN multimedia piece, as well as two 4-foot individual pieces in three days. I look forward to seeing what they come up with this year, and hope you will join me in experiencing the journey.